Oh, hi there! It’s been a hot minute since I shared a *real* outfit post but here I am. If you follow my Instagram (or view the widgets at the bottom of my blog page) then you’ve probably gotten used to those office bathroom selfies with the harsh florescent lighting, but on one of my days off recently, I found these photos on my nice camera and decided to share. 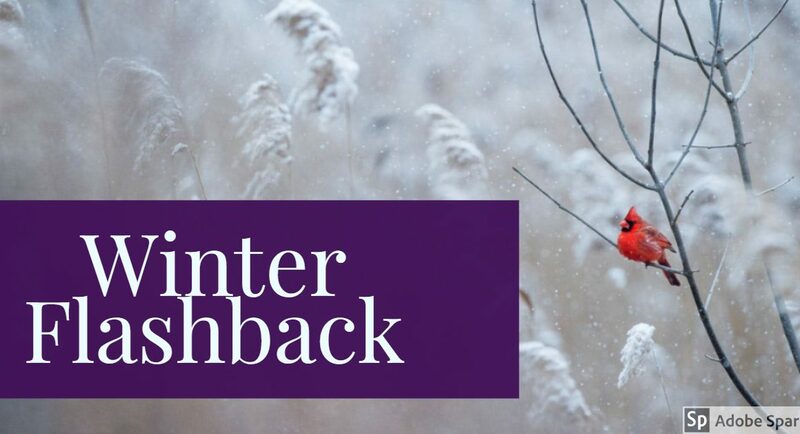 I realize that the weather in my neck of the woods (and most of the Southern US) is warming up because Spring is beginning to show itself in full force, but this was one of my favorite winter/colder weather outfits and it seemed a shame not to post it. It has rained every day this week in Durham and I’m over it. But I figured the rain + casual Friday at the office is a good chance to wear my favorite ankle boots and an army vest that hasn’t gotten much love lately. 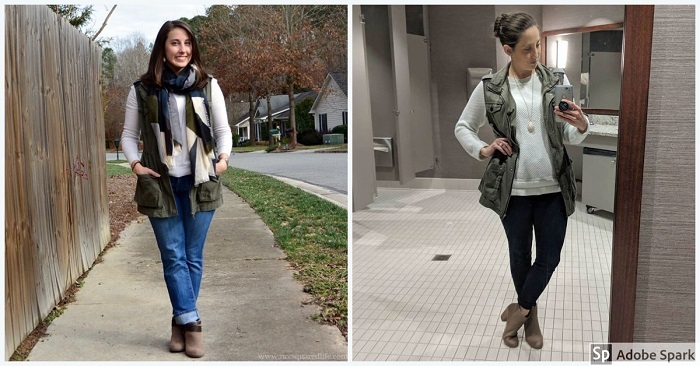 When I put this outfit on, I realized that it is extremely similar to one I wore four+ years ago, so I decided that this was a recreation/update of that outfit. Hey, look at me, back with some pictures of the clothes I put on my body! So, how many of you, like me, have new year’s resolutions to clean up your space and are KonMari-ing? If you have Netflix, you’ve probably seen the show Tidying Up with Marie Kondo or you’ve at least heard of it. I bought the book a few years ago so I was already familiar with the KonMari method of tidying when the show came out. If you’re not familiar with KonMari, you organize by room instead of my stuff. 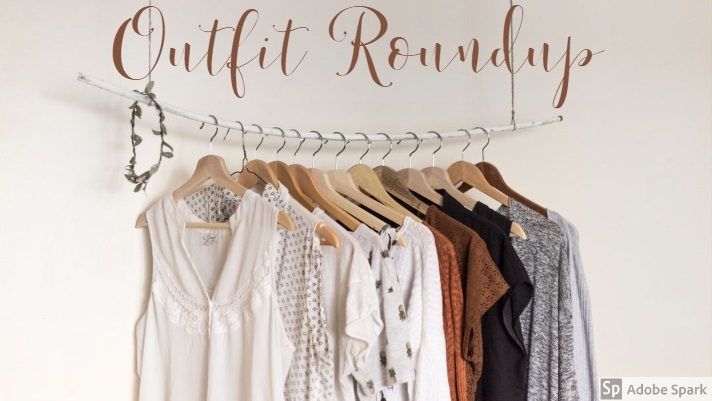 Then, you take EVERYTHING out of your closet, drawers, etc. and hold each item to determine whether it “sparks joy.” If it does, you keep it, and if it doesn’t, you get rid of it. 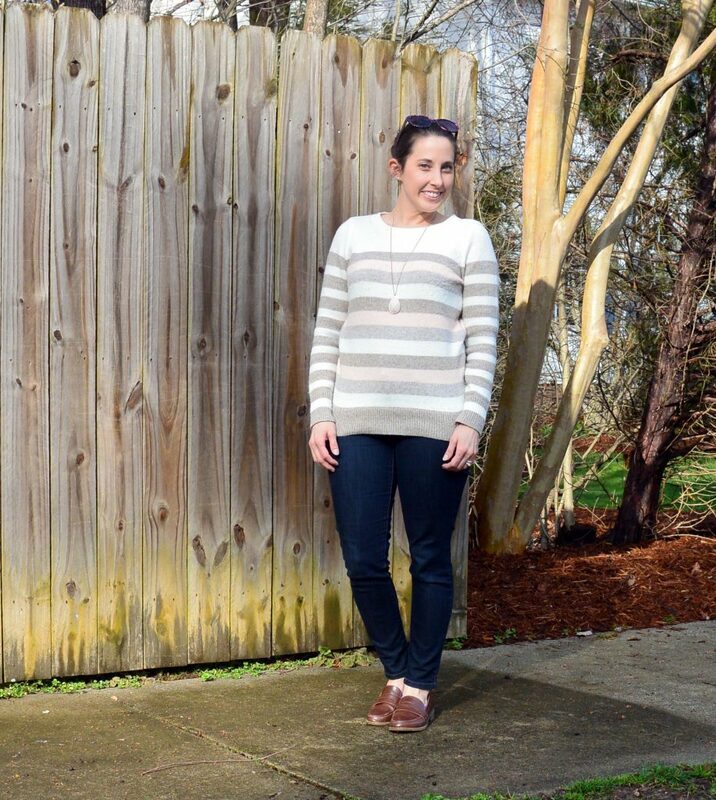 The idea of taking every single piece of clothing out of my closet at once is still too daunting, but as I’ve mentioned a few times on the blog, I’ve been taking pieces out a little at a time to ensure my style reflects who I am now, and to help me achieve my goal of living a somewhat minimalist lifestyle. 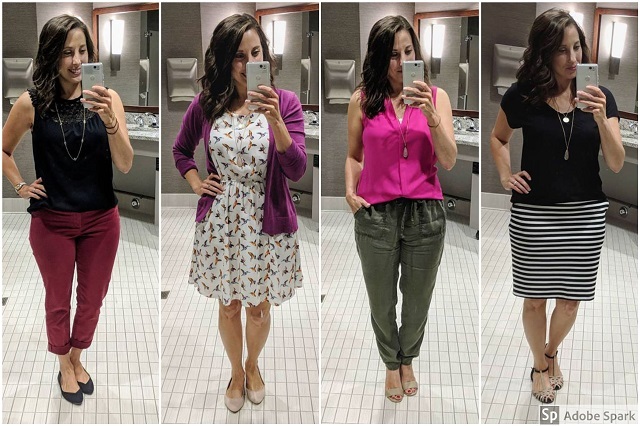 Freshly inspired by Marie Kondo and her show, I’ve taken even MORE pieces out of my closet in the past few weeks and I’m still feeling great about the pieces that remain, as evidenced by the return of my office-bathroom mirror selfies! Anyway, on to the outfits! 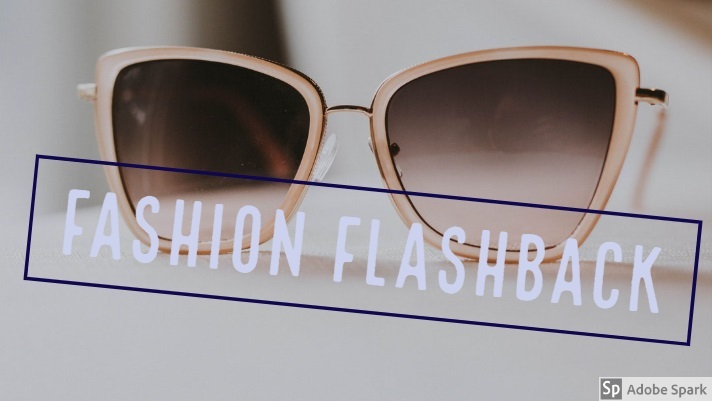 I’ve been blogging for several years now — even thought it certainly doesn’t feel like it’s been that long — and I was curious as to just how much my style has changed over those years. 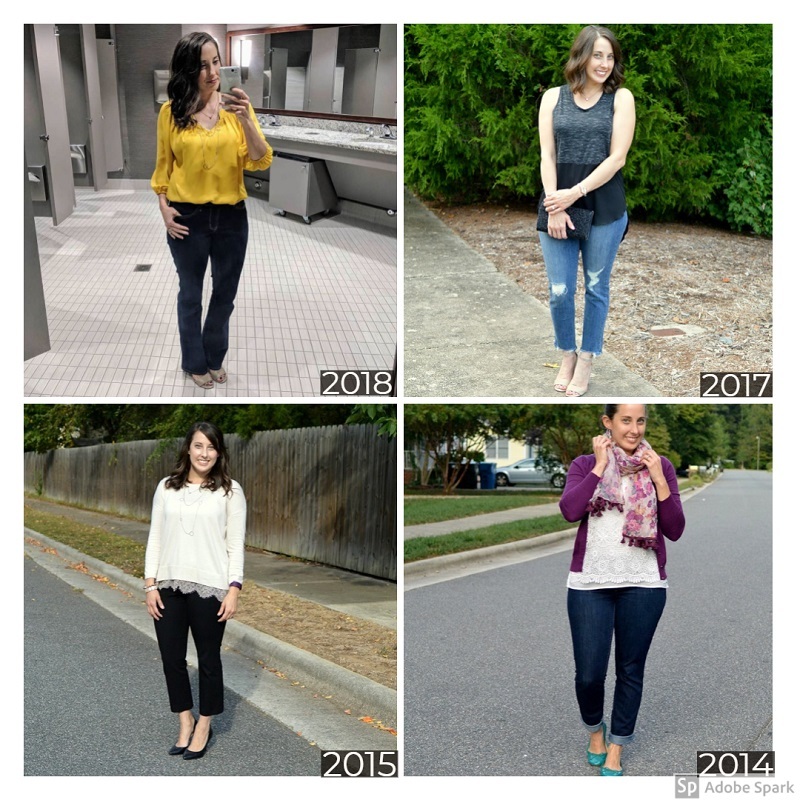 It’s always interesting to go back through the blog to see my outfits and the way I’ve evolved from year to year. 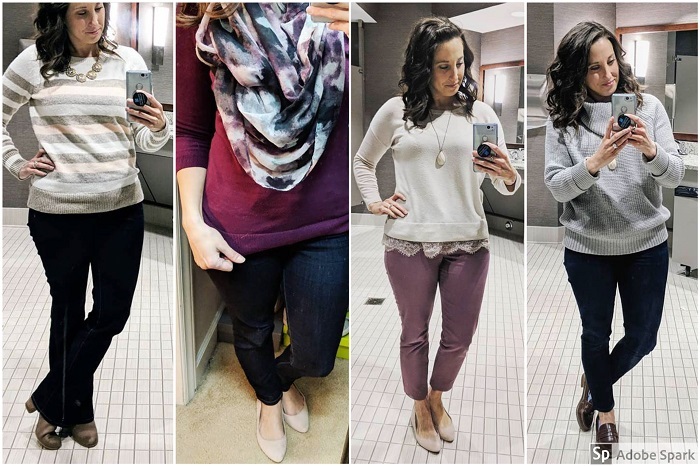 I’ve written about how my lifestyle has outgrown a lot of my clothes, so I’m working hard to clear my closet of any item that doesn’t make me feel like a million bucks every time I wear it. I’m also trying to live a more minimal life to focus more on experiences than material things. It’s harder than it should be due to the emotional value I place on things. I’m working on that, as well. I don’t think I’m quite ready for a capsule (or minimalist) wardrobe yet, but I might be moving more toward that direction. Hi, I’m Nikki. This is where I blog about my life and style. I’m a wife, a new mother, sushi lover, coffee drinker, and a social justice warrior. Welcome to my little corner of the world where I try to lead by example! Feeling Out of My Element But My Dress is Cute! I Love Being a Mom… Who Knew?